This paper explores the problem of autonomous, in-hand regrasping--the problem of moving from an initial grasp on an object to a desired grasp using the dexterity of a robot's fingers. We propose a planner for this problem which alternates between finger gaiting, and in-grasp manipulation. Finger gaiting enables the robot to move a single finger to a new contact location on the object, while the remaining fingers stably hold the object. 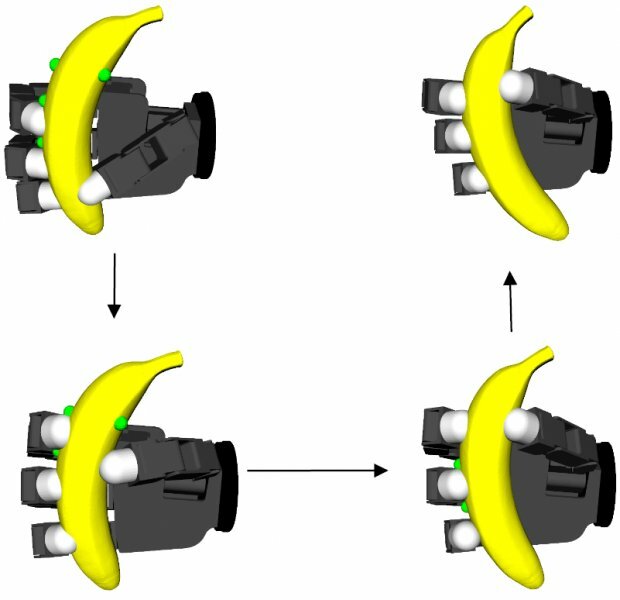 In-grasp manipulation moves the object to a new pose relative to the robot's palm, while maintaining the contact locations between the hand and object. Given the object's geometry (as a mesh), the hand's kinematic structure, and the initial and desired grasps, we plan a sequence of finger gaits and object reposing actions to reach the desired grasp without dropping the object. We propose an optimization based approach and report in-hand regrasping plans for 5 objects over 5 in-hand regrasp goals each. The plans generated by our planner are collision free and guarantee kinematic feasibility. We generate plans for moving from an initial fingertip grasp to desired fingertip grasp. We can generate plans on any arbitrary object, given the object&rsquo;s mesh. Our method performs alternating optimization of fingertip relocation (finger-gaiting) and object reposing (in-grasp manipulation). We solve the alternating optimizations through sequential quadratic programming.